This entry was posted in Uncategorized and tagged automobile, car, Civic, Honda by christao408. Bookmark the permalink. I used to drive a Mazda 626 with manual transmission. It was a nice car. Oh man. Believe it or not, I’m only 21 years old and I have gone through 4 cars in 2 years. There was a time recently when I had 3 at the same time. Now I’m down to two. This kinda inspires me to blog about that. But I don’t know if I will. Haha. I remember that more youthful Chris in front of the Civic. Handsome fellow. And also remember that car as well! You could buy another Civic! Honestly, us men and our cars! :)I remember that I learned to drive in my Mom’s 1980 Toyota Corolla. It was a stick and I’m grateful I learned how to drive it because I can now pretty much drive just about anything.My first purchased car though was a souped up “66” Chevy II SS. What a gas hog (6 mpg) but I was in heaven and it kicked a$$!I think as guys especially we never forget our first cars. Really. Hondas seem to be everlasting. You guys and your cars. Sayeed has a Mustang which is a 1997 (?1998) model. It is souped up to a T. It is stick shift and he really should sell it. It has about 20 thousand miles on it, if that. He is just dragging his feet about selling it. He likes it so much. I had given that to him as his high school graduation gift. Now he has a Lexus and an Infinite; I keep telling him that he needs to sell it. So,he has a ” for sale ” sign on the front shield. But when people call and ask him about it, he hums and haws all the time. Crazy kid. yes, it’s rather difficult to find a parking spot in SF. i would know after living there for about a year. and yes, anyone would do just fine getting around on transit as i did. it’s a great city. i’m starting to miss it. @rudyhou – Maybe time to move back, eh? The thing about parking there that was crazy is that I’d literally forget where I had parked. In fact, we had a dry erase board near the phone and I got into the habit of writing my parking location as soon as I walked in the door, so I didn’t foget it! @ZSA_MD – It is easy to get attached to a car. I’m generally not a big car person, but I enjoyed this Honda because it was comfortable, very low maintenance, and ran like a charm. @stebow – They are very much a part of our lives, aren’t they? For most of us, we’ll own less than maybe ten cars (if that) in our whole lives, so each one is around for a good length of time. @marc11864 – I agree that learning to drive stick shift is very important. Especially if you’re going to be outside the US, where stick shifts can be more common. @yang1815 – I’ve considered it although haven’t been inside one in years. The current styling doesn’t do too much for me. I know that they’re trying to go after the young kids, which has always been a niche market for Civics, especially the hatchbacks. But I liked mine because the styling was pretty conventional. We’ll see. Honda also has the City, a slightly smaller car similar to the Civic. @TheCheshireGrins – And ever and ever…@foggysunnymorning – What year was your 626? 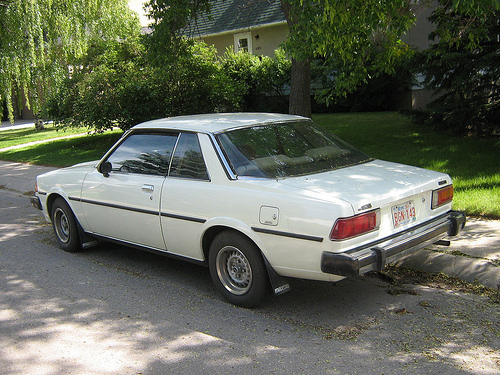 I know that Mazda eventually turned around but back in the early 80s it seems like their engineering wasn’t so good. Your Honda looked pretty new, sure took good care of it. Did you hang out in Hillcrest or PB down in SD? @Shades_of_Athena – I lived over in North Park. This was late 1996, early 1997, before North Park had really started to gentrify. I couldn’t remember. I think it was made in 1988, but I’m not sure. It was my first car in Canada. I bought it in January 2000 at $3700 and trade-in in 2003 at $1000. I didn’t get any major problems. Strange you had that pic taken the day you ‘sold’ the car, not the day you ‘bought’ it! Now, if you’d had a long ariel with a little ‘flag’ on top, you’d have been able to spot your car from down the street. Lol Great pic of you ! @christao408 – Yeah part of the appeal for the younger people is also their lower price. It’s still a very nice economical car.